Statler: You know what's wrong with this theater? It's the seats! Waldorf: What's wrong with them? Statler: They're facing the stage! Hohohohohohoho!!! Yellow Pearl: Have a nice extraction, Pink Lasagna. Squidward: "Patrick, just how stupid ARE you?" I is for imagine, M is for me, A is for the letter A, G is for G.
I is for imagine, N is for nice, E is for egad! I said 'imagine' twice! JD Hansel: A big part of what makes television not terrible right now, which to me is refreshing because I grew up in a time period when TV was by and large terrible, what makes it work is there are these companies like Netflix and Amazon Prime that aren't getting in the way of creators creating good things. When you look at a lot of shows that have been made by talented people but failed in the past, like there's an episode of Comedians in Cars Getting Coffee in which John Mulaney talks about his failed sitcom, and how the problem there was just too many suits in the room. Too many people who were not comedy writers coming in and telling the comedy writers what to do. There's this common theme of shows writers have worked on that have sucked because, they've complained that as soon as they were done writing, a conga line of 40 executives come into the room delivering their studio notes saying "This is what you need to do instead of being funny." And then you get a show that's not very enjoyable. So creative freedom is a big draw to Amazon and Netflix for good creators who have cool ideas, and I like that. I think that this new creativity and this openness to try new things is a very good thing that is making television watchable right now. JD: I actually like watching TV now. Frank Oz: Oh yeah! Fat Blue! Jerry Nelson: Yeah...Mr. Johnson as we sometimes called him. Frank: How did you get Fat Blue? Jerry: Oh, that was me! (laughter from the others) Getting ****** off at you for taking so long! (Frank laughs) "Oh, I'm sorry, oh let's do it again, take 24..." (everyone starts laughing as Jerry does Fat Blue) "JUST GET ME THE **** HAMBURGER!" Dave Goelz: Do your camel. Do the camel. Fran Brill: What's the camel? Dave: From acting class. Do the camel! Please! (Frank's quizzical expression dissolves as he begins to laugh) I haven't seen it in years. Fran: I don't know...have I seen this? I must've. Bill: Come on. Do it! Dave: Do the camel! (Fran, Dave, & Bill start chanting) CAMEL! CAMEL! CAMEL! CAMEL! Frank: Thirty-five years ago, I told you about the camel...and NOW you bring it back! Dave: I'd just like to see it. Frank: I'm not gonna do a god-**** camel! Bill: I'll be the sunset (Frank laughs uproariously) and you can be the camel in the foreground. Jerry: I'll be a palm tree! WAFFLE: Hello Class of 1985! Today we say goodbye to our School but we say hello to our future. MAKING FRENCH FRIES! Servo: But Joel.... why was the movie so bad? Crow: Yeah! It was cool in the beginning with the sidehacking, then they went right down the drain and they had to pad out the film with all that killing! Joel: Oh no, Crow.... it wasn’t killing that padded out the film. Only love..... pads the film. GONZO: Excuse me — Sam! Sam! SAM EAGLE: Not now, Gonzo. GONZO: But Sam, this is urgent. Come here! SAM EAGLE: (Gasps.) Really?! Here?! GONZO: Yes, indeed. Right over there! SAM EAGLE: Well of course, certainly. Ladies and gentlemen, we have an unexpected surprise. I have the great honor of introducing the one, the only, Mr. Mickey Mouse! RIZZO: Na na na na na na na na na na na na na — Hello! Hi there! Welcome to my park. How ya doin’? Hello! SAM EAGLE: (Sputters.) Whoa, whoa, whoa, whoa! SAM EAGLE: You are not Mickey Mouse — you are a rat! RIZZO: Rat-shmat! Besides, they’re tourists! What do they know? SAM EAGLE: Will you get out of here?! RIZZO: Okay, but do I still get my 10 bucks? SAM EAGLE: Get out! Get out! Get out! SAM EAGLE: Will you get out?! REALITY STAR: It is so amazing to spend one-on-one time with my husband with absolutely no chaperones. ME: Yeah, that's why you've got an entire camera and production crew following you around everywhere. Green sleeves: Get out of the way, you stupid idiot! Rod Rescueman: It’s alright, I’m wearing rubber underwear! Soldier: Tim, They've got your wife! Soldier: You are now! To America! Slade: For the record, I'm nobody's Servant! Kip Baffle: We're on Instagram @DillonGale and Facebook, the DillonGale Idiots. Host 1: I really love your show, by the way. I saw a 5 minute clip of it and I really enjoyed it. Kip: Thanks. We haven't done anything in a really long time, but we might be doing more soon. We're working on some stuff. 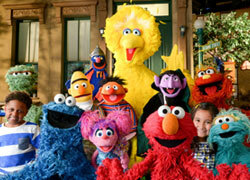 Host 2: I hope you do, and in the meantime, you can catch Ryan on the new season of Sesame Street. Kip: If you wanna watch children's television, if that's your thing. "Jean is a nice person. So, she happens to like girls instead of guys. Some people like cats instead of dogs. Frankly, I'd rather live with a lesbian than a cat. Unless the lesbian sheds. Then I don't know." Anyone know a lesbian? We need to consult with one to find out if they do, indeed, shed. ''Steve Whitmire looks like a poodle.'' - @MWoO talking about Steve Whitmire's hair. LittleJerry92, Froggy Fool and Pig's Laundry like this. Jarrod Fairclough: On September 7th, I wrote a post on the Muppet Mindset saying "Is it time to retire the term Muppeteer?" It was just an idea of if Jim Henson didn't like the word, maybe we shouldn't keep using it as we do. I've stopped using it on the website, Frank Oz doesn't like the word, so I said "Is it time to retire it?" A lot of people got super aggressive to me. I got called names that I wouldn't even call JD. Just horrible words. That was probably the worst thing I had to deal with last year. I don't generally delete a lot of comments unless they're aggressive for the sake of aggressive. I deleted so many from that, cause people were just being horrible. And then a week later, ToughPigs wrote a post saying "Maybe we don't need Rizzo anymore. If no one's gonna take over for Steve for Rizzo, maybe it's okay if Rizzo's gone." And some of these same people were like "Oh, that's a wonderful idea, yeah, I get what you mean, fantastic!" I'm like "So you're saying get rid of Rizzo and that's okay, but I say stop saying the word Muppeteer and I'm an ***?" 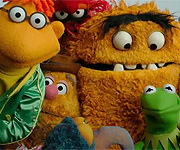 Clayton Roederer: I have noticed a tendency for some people if the Muppet Mindset or that side of Muppet fandom says something, they tend to be more skeptical of it whereas they tend to go with almost everything ToughPigs says. Jarrod: Look, when I took over the Mindset, a lot of people didn't like it, a lot of people left, a lot of people stopped paying attention to it. I've built up the fandom since then, I've got myself an extra ten-thousand or 15-thousand Twitter followers than I had when I started, Facebook followers as well. So I think I've got myself a nice little niche now, but there are still a faction of fans who don't like me, don't like anything I have to say, and I just tend to ignore a lot of what they write to me.